The Maryland Department of Natural Resources is working to establish an economically-productive and sustainable oyster harvesting cooperative in Anne Arundel County. With funding from the Chesapeake and Atlantic Coastal Bays Trust Fund and the National Fish and Wildlife Foundation, the comprehensive private-public partnership will enhance the long-term business and economic viability of watermen while addressing oyster restoration and water quality goals. The effort supports the Hogan administration’s commitment to enhancing, protecting and restoring Maryland’s environment and natural resources while simultaneously fostering economic opportunity and job growth. The partnership hopes to provide a community of watermen with supplemental income harvesting oysters while providing environmental benefits to the bay. Oyster aquaculture is considered a best management practice for nutrient reduction in the Chesapeake Bay. 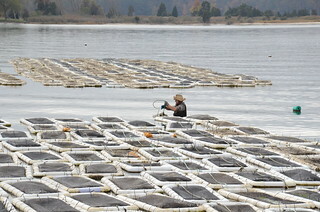 The essential components of the program include: forming an oyster cooperative to manage a targeted oyster bar; developing and maintaining a sustainable system of harvesting and planting; coordinating a rotational harvest of market-size oysters; and establishing a revolving investment fund to finance and grow the program. Management partners include the Department of Natural Resources, U.S. Environmental Protection Agency, University of Maryland, Anne Arundel County and Oyster Recovery Partnership.